Register for Urban Adventures Summer Day Camp! Summer is just around the corner! Accordingly, we are working hard at Groundwork Lawrence to prepare for the multitude of exciting events and programs that take place during the summer months. Sign up for a CSA share today with Farmer Dave's to receive a weekly share of fresh, local produce. And, because we aim to make this local, healthy food more accessible, we will once again be running the Groundwork Lawrence Share-a-Share™ program. In terms of events, this Saturday is the 14th Annual Kite Festival, and we would love to see you there! Urban Adventures Day Camp will also be starting in a few short weeks, so register your children today. 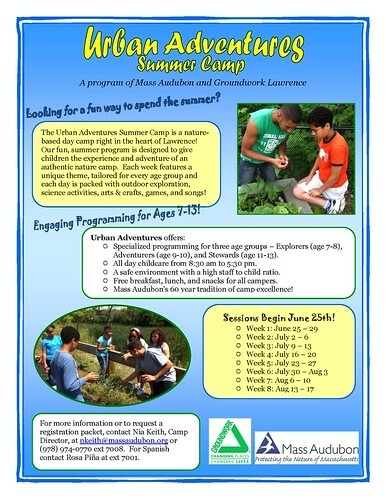 There is so much to get involved with at Groundwork Lawrence, and doing so during the summer is especially fun. We hope you'll join us! 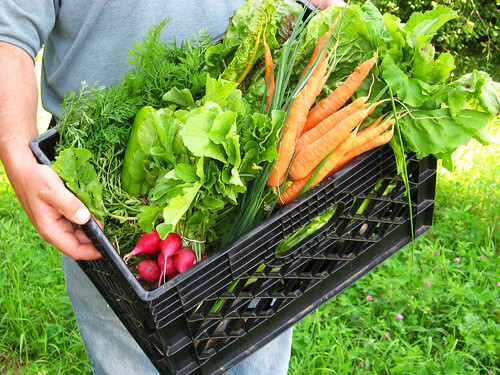 Sign up for a CSA Share with Farmer Dave's! that can be picked up at 60 Island Street in Lawrence. Members invest in Farmer Dave's at the beginning of the season, and in return receive a weekly share of the harvest. Farmer Dave's offers a pre-boxed share or a choose-your-own option as well as a fruit share and late fall share. Visit Farmer Dave's website for more information and to register. At Groundwork Lawrence, we aim to make fresh produce affordable and accessible. In order to do so, we have established a fund to subsidize the cost of CSA shares for both individuals and families facing financial difficulties. Thus far in 2012, we have made steady progress towards our goal of raising $15,000 for the program. Our goal has increased $5,000 from last year, since we are now including the Farmers Market in the Share-a-Share™ program. As we extend the reach of this greatly beneficial program, more funding is required. This year, donations will be used to lower the cost of fresh food through fresh food donations at food pantries, subsidized CSA shares, and incentive programs at the local Farmers Markets. Through Groundwork Share-a-Share, you can make a tax-deductible donation to help us provide the Lawrence community with the benefits that fresh, locally-grown food offer. We are already on our way towards our goal of $15,000, but need more support to get there! Help us spread the benefits of healthy, local food and expand the program by donating today! Join us this Saturday at the 14th Annual Kite Festival! 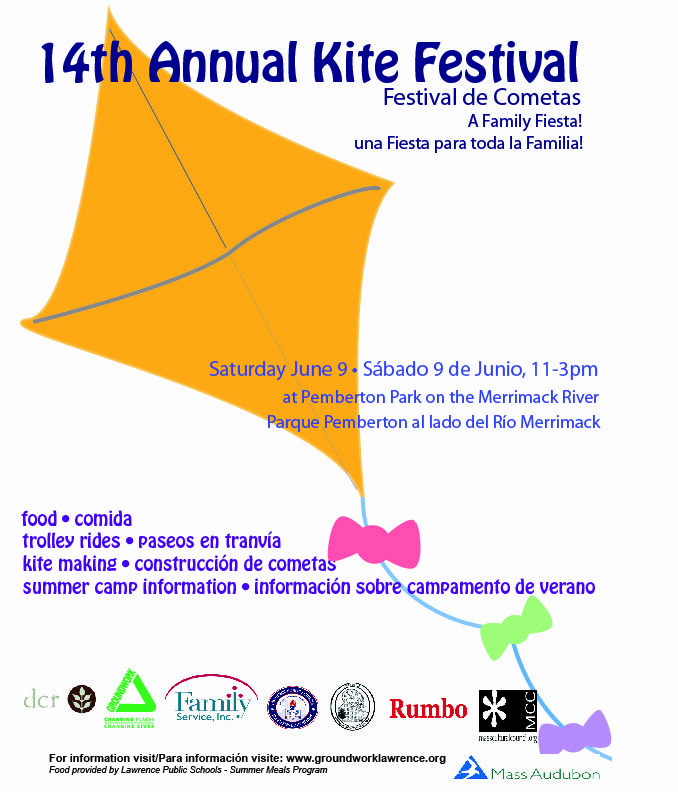 This Saturday, June 9th, is the 14th Annual Kite Festival in Pemberton Park on the Merrimack River. Come join us for food, trolley rides, kite making, and information on the Urban Adventures Summer Day Camp! The festival will take place from 11 AM to 3 PM, and will be fun for all ages! Food will be provided by Lawrence Public Schools through the Summer Meals Program, so stop by to grab a bite to eat and stay to enjoy the activities in the park! Urban Adventures Summer Day Camp Registration is Still Open! If you haven't yet registered for this year's Urban Adventures Summer Camp, do so today! The Camp is an 8-week nature-based day camp located in the heart of Lawrence, and provides children with an authentic nature camp experience. Urban Adventures has specialized programming for three age groups (7-12), explores a unique theme each week, and packs every day with crafts, games, songs, and lots of outdoor exploration! Camp starts on June 25, so contact Nia at 978-974-0770 x7008 or by email today! Thanks for learning more about our work! We look forward to connecting with you on our programs and impact in the community throughout the summer season.